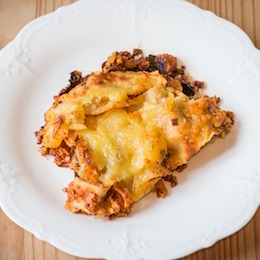 A great selection of seafood lasagne recipes - the mixture can be to your taste or availability - canned tuna, crab or shrimp - fresh white fish, tuna, prawns - frozen mussels, lobster, shrimp, crabmeat - your choice. Mix two or three different types to a total of 12 ounces - the taste of the tomato sauce with herbs will be fairly dominant, so don't waste money on really expensive, delicate flavored fish, such as sole. I have made a very tasty seafood lasagne/lasagna purely out of canned tuna and a handful of defrosted prawns (shrimp). In the UK, we have italian stock cubes available - I sometimes use one of those instead of the basil - it is really tasty and not much of a cheat. I would sometimes use passata (sieved tomatoes) instead of canned tomatoes and add the herbs. Also, if I feel like it, I would use a jar of italian tomato sauce - such as Dol Mio or Ragu as my tomato base. 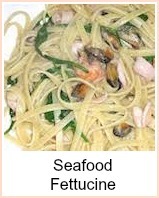 I would then purely add the seafood mix to this and make up the seafood lasagne recipes in the normal way. Watch this super easy video where I'm showing you how to make tuna lasagne cooked in the slow cooker - you can use any sort of fish of course, I'm just using tuna to illustrate. Set your oven to Gas Mark 4, 350F or 180C. Heat the oil in a pan, add the onion and garlic. Fry gently until softened. Add the tomatoes and bring to the boil. Add the seafood and basil. Simmer two or three minutes. Make the sauce by bringing the milk to the boil. Put the cornflour and mustard in a small mug or bowl and combine. Mix to a smooth paste with milk. Return the sauce to the heat and stir until thickened. Bring the pan off the heat and add the grated cheese - stir to combine the cheese in with the white sauce. Assemble the lasagne/lasagna in a shallow dish. Start with a layer of cheese sauce and then seafood sauce. Add a layer of lasagne/lasagna sheets - break them up if necessary. Then a layer of seafood sauce, then lasagne/lasagna sheets. Continue unil you have run out of sauce, making your last layer lasagne/lasagna sheets. Pour your cheese sauce on top, making sure it covers the whole dish. Sprinkle parmesan on top and bake in the oven for about 40 minutes. 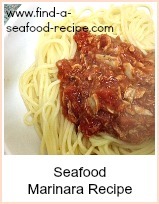 The seafood sauce recipe can be used with any pasta as an alternative to bolgnese. 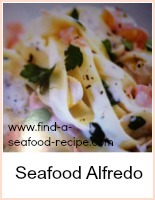 A really easy basic seafood lasagne recipe with suggestions for changes. Such a great meal to serve as part of a dinner party as you can prepare it ahead, leaving you free to concentrate on the rest of the meal or your guests.